Students at the St. George’s learn more about RVIPF and the law enforcement profession on their Career Day. Wednesday, May 28 – The RVIPF newly-appointed Neighbourhood Police Officers continue to actively engage their communities and are making lasting impressions. High praise is being given to Neighbourhood Officer Damian Ash, assigned to the Lower Estate/Huntums Ghut area, who has been making his rounds through the Long Bush, Lower Estate and Huntums Ghut communities. Owner of Billy’s Discount Supermarket and P3, Paper Plastic Products Mr. Sinclair Flemming has expressed his delight with the working relationship he has already established with Officer Ash. “From the first time he entered my store, I felt his desire to reduce crime and support a safer neighborhood for the Long Bush area. He gave me his word that he would work with the businesses within the Long Bush community to improve security and I made a promise to support these efforts. I have his business card and direct access to him and thus far I have seen the commitment. Officer Ash was also instrumental in rallying the young basketball players from Lower Estate, Huntums Ghut, Purcell and Baugher Bay area’s to cleanup around the Lower Estate Basketball Court. Players from the Under 17 Boys, Spurs, And 1 and High Speed filled several garbage bags with weeds, cans, bottles, and Styrofoam containers collected around the court and surrounding areas. Coaches Brian “Bash’ Brewley and Sharlene Hill supervised in the clean up. 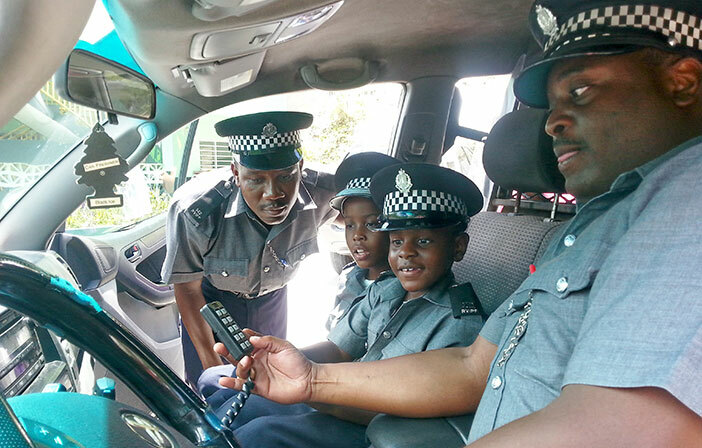 In addition, Neighbourhood Officers as well as officers from other law enforcement agencies made their presence felt at the St. George’s School Career Day. Students of the Anglican School, dressed in the uniform of their chosen law enforcement profession, took the opportunity to sit with the officers of the RVIPF, Prison, Fire, Immigration and Customs Departments and ask about their careers in enforcement on this out-of-classroom experience.